Employee evaluations allow managers to review how their teams are doing. Admins are able to create multiple ongoing evaluation cycles and manage them separately. Multiple Choice Questions: By default the scale ranges from Strong No, No, Yes to Strong Yes. Open Ended Questions: This is an area for free form responses based on your prompts. They will be able to refer to Manager Requested Feedback and Self Reflections by clicking on "See Past Feedback" to incorporate these notes. 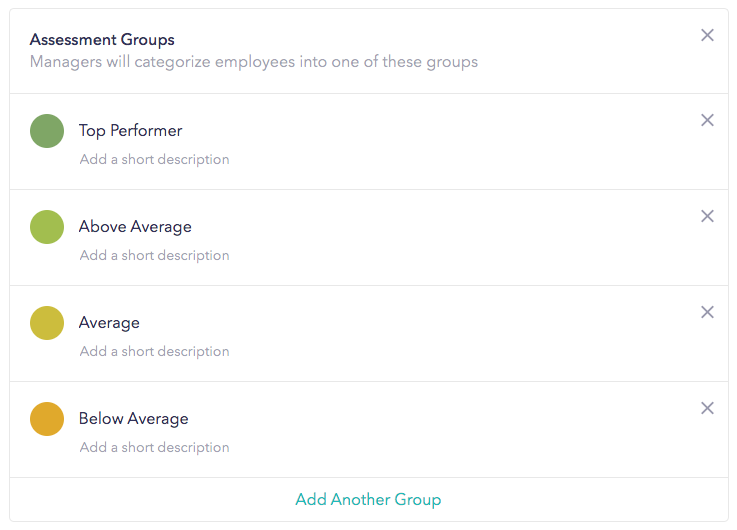 Assessment Groups: This is a set of categories that managers and Admins can place employees into and later use as filters for employees in the cycle. This is particularly helpful for calibration sessions. Only Admins can set up an evaluation cycle. Managers and Admins/HRBPs can update all responses, even past the due date, until an Admin ends the cycle. Updates are noted in the activity log for each employee, along with who made those changes. To get started, switch over to Admin mode by clicking on "Admin Settings" in the bottom left corner of the homepage. Click on "Create New Evaluation". Add a name, start date and end date. You can also adjust the times and time zones. After clicking on "Next", add questions. For multiple choice questions, you can amend the wording of the scale. For Assessment Groups, you can only have one set. Descriptions can be added for more clarity. Feel free to contact us at support@zugata.com for any recommendations! Choose which questions you would like to have managers share with their direct reports, if at all. You can wait to enable sharing later (e.g. until after managers have finished their evaluations). This can be toggled before, during or after a cycle has ended. Click "Next" to preview the evaluation. This will call out any questions that are shared with an asterisk (*). You can amend this selection before the cycle's start date; after that, it will be locked. You can wait to select employees until a later time by selecting "Finish". If you are ready to add employees, select either manually using filters provided or add them using a CSV. Manually: Clicking on the box to the left of "Team Members" will select everyone in the organization. If you click it again, it will deselect everyone. CSV: The CSV format is a single column of your employees' emails used in their Zugata profiles. Using a spreadsheet editor of your choice, export this single column to a CSV. To access this feature in Zugata, click on "upload a CSV." You can add people to a cycle even after it starts. Once you're satisfied with the selection, click "Finish". If you need to make any changes to questions or what questions you'd like to be shared, these must be done before the cycle has started. Here's an outline of how to edit your evaluation. 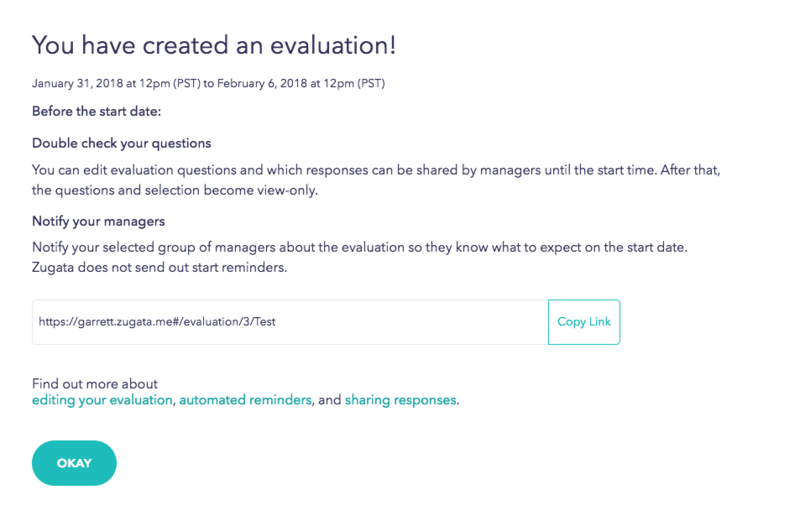 Send a kickoff email to provide your managers with context for the evaluation. We provide a link to the evaluation so that managers can navigate easily to their evaluations. Click on Employee Evaluations and then the evaluation to edit. At the top right, select the Edit menu "..." to view options for editing. Changing the end date of your evaluation will update email notifications to your managers if they have not completed evaluations yet. Please see more information about automated reminders for evaluations. Changing an employee's manager will notify the new manager by email that there are new direct reports for them to review. Enabling sharing will notify managers with an in-app notification only. They will need to take action to share their evaluations when they are ready.